Women in Engineering Summer Program in Austria – Let’s start this blog off with a little bit of honesty: After 10 hours straight of overnight flying and travelling, I walked out of the Linz airport to 30+ degree weather and into a completely different country across the world where I was without my fiancé and my dogs, and where very few people spoke fluent English. I wasn’t sure what I had gotten myself into, but I was ready for the experience! The first day of classes was the best day for me. I met all of the other girls attending the academy and every single one of them was amazing. 30 women from 12 different countries around the world who were all here to study engineering and science, travel abroad, and make international connections. While I can say I’ve never been around this many girls before (especially under 1 roof), it was something I’m glad I got to experience. We started off with an activity where we were paired with someone we didn’t know, and we had to draw on paper what our culture was. Then we had to explain it to our partner, and our partner had to explain to the class who we were and what our culture was. It was a great experience because you get to understand a lot more about a person when you have to stand up and introduce them to everyone else! Our first week was a lot of fun! So far we have had lectures on the dynamics of space vehicles, robotics, sustainability, magnetism, creative science, and synthetic biology. 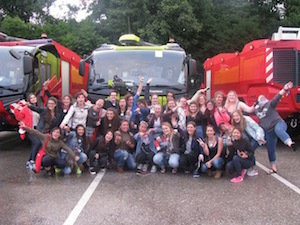 We took a tour of Rosenbauer – the largest supplier of airport fire trucks in the world, completed a lab on DNA forensics – analyzing our own DNA in the process, and took a trip to the small town of Traunkirchen to do a creative science exercise in making molds using our own body parts and filling them with agar to grow and study micro bacteria. The first week has been filled with so much education, excitement and adventure.